Simplicity and elegance have never made such a perfect combination. 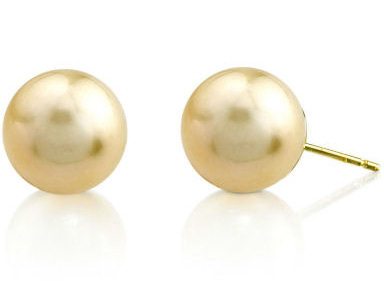 A beautiful pair of 9mm golden pearls on 14k yellow gold stud backings. High quality golden pearls represent only 10%-20% of the pearl's harvest and are extremely rare. These pearls have a Very High grade luster, our highest grade, and are AAA in quality. We guarantee our 9mm Golden South Sea Pearl Stud Earrings to be high quality, authentic jewelry, as described above.